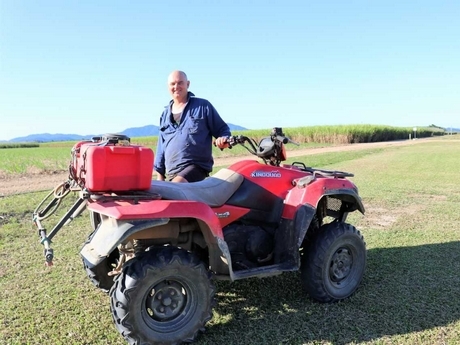 Some North Queensland farmers are nervously watching the weather over the next few days, and praying the rain eases, with the threat of flooding hanging over their heads. Leon Collins grows bananas in the Tully Valley, 210 kilometres north by road from the city of Townsville, which has been inundated by flood waters over the past few days, with more than 20,000 homes under threat as hundreds of residents have been evacuated. "We are lucky, we have dodged a bullet so far - twice," he said. 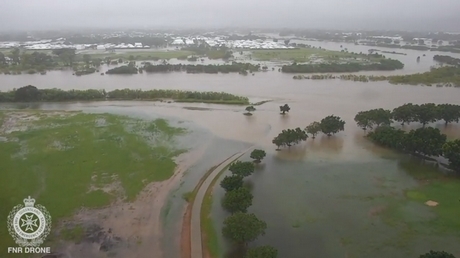 "Townsville has been getting what we normally get in a wet season. The forecast keeps changing, everything is saturated, everything is chock-a-block, so if we get eight inches in any 24-hour period, we will flood - there's no doubt about it. Townsville has not had a rain event like this for many, many years. What's happened is that the rain all seems to be coastal, where we are in Rockingham Bay. A lot of it has been hitting right on the coast, so it has helped us. We never miss out usually, but I don't wish what Townsville has had on anyone." Mr Collins' two family farms still have been receiving two inches a day, and while he says the banana plants love water, it is important to ensure proper drainage. But he says the biggest impact to supply for the region has been road closures. "I have heard that if everything goes the way that is forecast, there won't be a truck leaving out of Townsville until Wednesday, so we are going to have a gap in supply at the market end," Mr Collins said. "There's nothing you can do about it. The earliest (it will reopen) is Wednesday, they are saying. They will be shut for another 24 hours tomorrow, and see how they go the next day." The majority of dams in North Queensland are at capacity, and he adds that his region is just recovering after a major flood last March, that knocked the banana growers around. "We've only just recovered from that, in terms of bunch size," Mr Collins said. "We've had below production figures where that hit of course. But we just got back to normal production figures and we have another flood lingering over our head. It hasn't happened yet, but the forecasters are saying maybe Friday and Saturday we might be in for an influx. But let’s hope we can dodge it for a third time. Even though we have had a lot of rain, and missed a lot on our farms, two inches of rain is still significant, but banana production hasn't had any flood damage yet. But anything can happen." He admits it is a concerning sight, given Tully is traditionally the wettest part of Australia and the peak of the wet season is still a month away. "It's only the start of the wet season, we are not even half way - we have got to get through March yet," Mr Collins said. "March is traditionally our wettest month of the year. We are only just starting February. Whatever we have had to date now, it is only just the start of it. We will get more, there is no doubt about that, I just hope for everyone we keep below the major flood levels. We probably will get minor flooding, but if we get a major flood it will do a lot of damage like it did last year. If we had the rain that Townsville had, it would wipe us out. We'd be swimming, with crocodiles in our shed." Mr Collins also grows avocados, further north in Lakeland, in the dry tropics, and weather events like this were a major reason for spanning across different growing regions. He is one of a few growers who have put in avocado crops in the region, with some trial blocks as well. "We diversified into growing bananas into a new area, we have two farms in Tully and another in Lakeland," he said. "Geographically we did that to spread our risk of cyclone damage and disease. You shouldn't get hit in the both place in the same year. That was one of the reasons for starting up there. It was a big investment, a Greenfield project; you walk in with nothing, no infrastructure - all you get is a paddock. You have to find water, and drill for it." He says both his bananas and avocados are growing well this season with the perfect amount of rainfall in recent months. "The avocados are growing well because we are getting showers of rain and then breaks - it's spread out and we are not getting big influxes of rain," he said. "So, it's virtually all soaking rain, which is good. What it is doing is replenishing the underground water supply, which is a big problem in the north, because we have been running below average rainfall for years - one after the other." Avocados are a new venture for Mr Collins, who says the rich, red soil in the region makes for excellent growing conditions, and this season they have benefited from over 40 inches of rain in December and January combined. "We've just started out, we are new to the industry. We planted 10,000 trees in our first year and there is another 12,000 going in this year. It's looking good, a new growing area in Lakeland. It's a bit hard to get established up there due to the heat and wind, but once they settle in and get roots down, they look quite well – and the growth rates even impressed me. But bananas will be our staple crop. As the years go on, we can plant more and more, as we have land available to us - as long as we can secure more water. That's what it is about in the dry tropics, securing reliable water."